evin Waters, SJ, holds undergraduate and graduate degrees in classics, philosophy, music, and theology. He was awarded a doctorate in music composition from the University of Washington in 1969; he studied composition with John Verrall, Roy Harris and Bruno Batolozzi. He served as a panelist for the Music Division of the National Endowment for the Arts, Director of the Jesuit Institute for the Arts, and chaired Seattle University's Department of Fine Arts for many years. Currently he is Dean Emeritus of the College of Arts and Sciences, Gonzaga University, and is professor of both Philosophy and Music at the university. Fr. Waters has composed two operas, four works for orchestra, a number of pieces for small ensembles, as well as several large choral works. The Seattle Symphony, Kronos Quartet, Emerald City Brass Quintet, and Colorado State University Orchestra have performed some of these works and others have been premiered in San Francisco, Guadalajara and Rome. His opera Dear Ignatius, Dear Isabel, commissioned by Loyola College of Maryland and produced in Baltimore for the school's 125th anniversary, was later produced in Seattle and New Orleans. KSPS-TV, Spokane, telecast the opera in 1989 during its fourth production. Another opera, Edith Stein, is currently under consideration for performances in Poland by the Krakow Opera. Fr. Waters' organ concerto, Waumandee Township, was premiered by Joseph Adams, soloist, with Robert Spittal conducting members of the Spokane Symphony during the Regional Convention of the American Guild of Organists in July 1999. 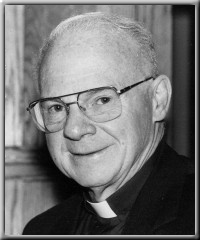 Kevin Waters has been a member of the Oregon Province of the Society of Jesus (Jesuits) since August 1951. He began his teaching career at Yakima's Marquette High School in 1958.